Cookies 'n' Creme Decadent S'Mores! Colorado Airstream Dream: We Rented an Airstream AGAIN! We Rented Airstream for "Road Trip 2018"! This photo shows the current state of our 1971 Airstream Overlander. I will do a little backtracking soon with some info about how we got to this point including how we got the shell-off and why we chose to go this round. But here is where we are today. Our trailer shell and chassis are separated. The belly pan has been unattached, and the fresh water tank is out. Rotten sub-floor. Ours is a rear-bath model. Can you tell? Belly pan removal in the front. Belly pan removal in the back. I really kept waiting for the snake to come slithering out of there, but it never did, thankfully. I will also be creating a YouTube channel so that I can share some videos or what/how we are tackling some of the items on our monster to-do list. We have found lots of great info on YouTube and various blogs and forums, and we want to share our journey with the hope that it helps other as well. Photo by Liz Sparling at Cherrybird Photography. Welcome to Daydreams & Airstreams! Welcome to Daydreams & Airstreams! We are the DeGraffenreid family: Amanda (that's me! ), Bryan, Maddox, and Zoë. On January 24, 2015, after years of “off again—on again” searching, we purchased a vintage Airstream. More on that story later (how I found it and how we got it home)! 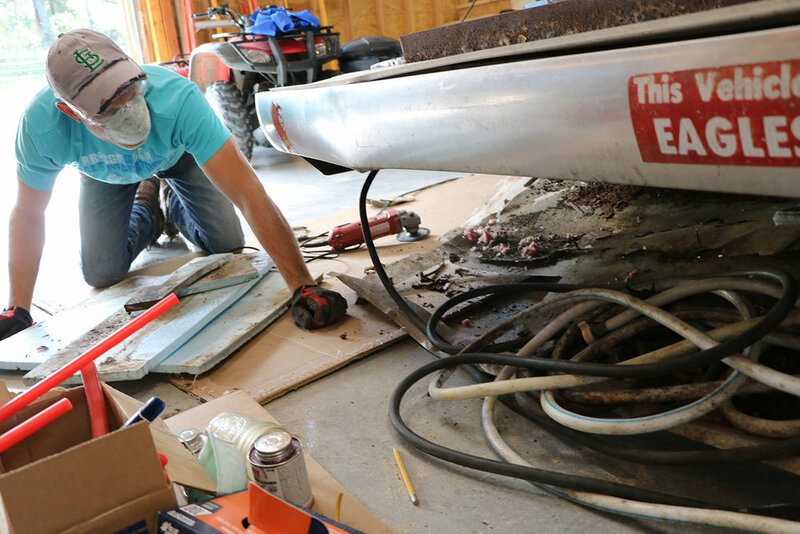 For years, we knew we wanted to find and purchase a “project Airstream” that we could gut and finish out to be exactly what we wanted. But “a project Airstream” was a bit of an understatement! This blog will be a diary of our work, inspiration, and ideas as we work on making this shiny beauty a road-ready trailer again. We hope we can offer some advice, tips, and perspective on our Airstream remodel journey for others traveling this same path. Thanks for stopping by our blog! We are excited you are here! January 24, 2015: We bought our 1971 Airstream Overlander in Camdenton, Missouri. It was an exciting day! In many ways, I feel like this Airstream found us. After searching far and wide, this gem was basically in our backyard. We went to check her out and hours later, she was ours! Welcome to Daydreams & Airstreams. I am Amanda and this is a blog about our 1971 Airstream Overlander rehab project and other things I daydream about. You can find out more about my design work here. Shop the Daydreams & Airstreams store! We will be adding new shirts soon! Check back to see what is available.